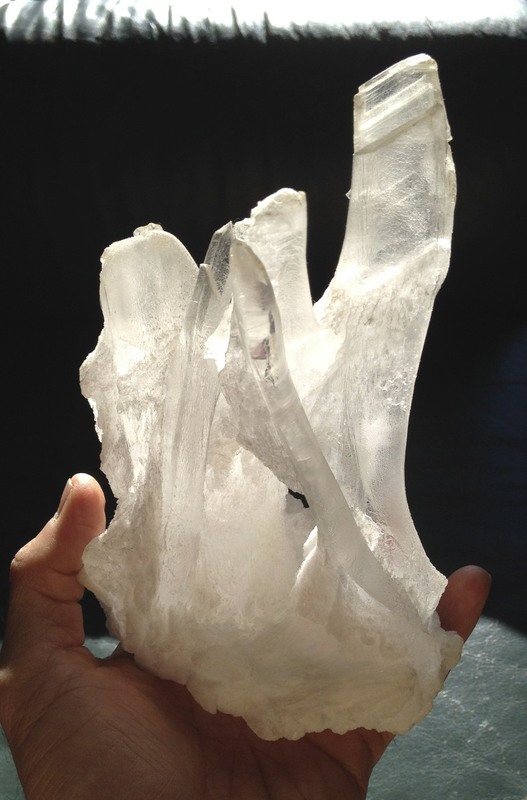 Fenster, or Skeletal Quartz, is emblematic of “sickness in health” – where the interior has been compromised – but the shell and structure remain quite solid. And yet, people belly ache about their seasonal illnesses all year long. The common cold – in spite of what people claim about vaccines being effective [I’m not convinced] – this complex of viruses (if that’s fair to call them) impacts just about everyone in the northern hemispher. And I think it’s emblematic of all diseases, though fortunately, it’s not a commonly fatal (or chronic) malady. I thought I’d transcended all that. 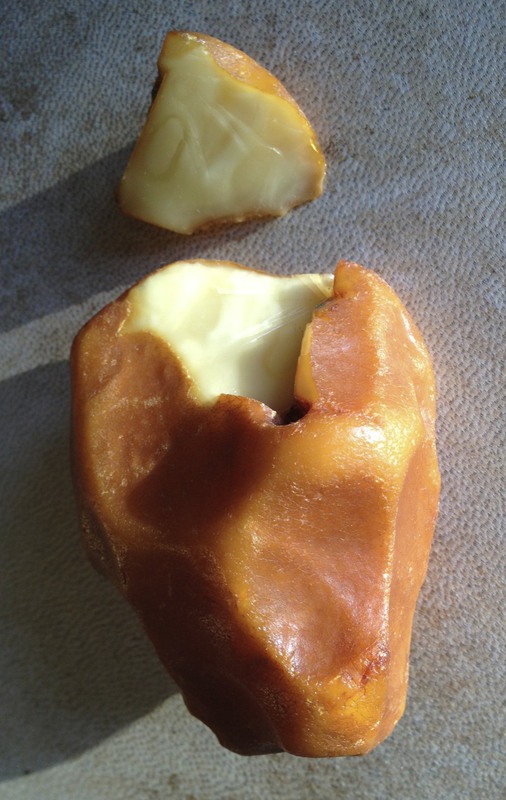 With the parting of ways I’ve had with Sugar, and anything (chips or nuts) that come in a bag [the rancid oils are harmful]…it’s been literally years since I’ve really been hit by anything like this. What usually happens, is that the symptoms try to get a grip on me, but their effects are weak, and the real deal never fully takes hold. Just a few month ago, everyone in my family got some bad bugs, but I wasn’t touched at all (even though everyone was coughing all over me). Funny how immune we can be sometimes. Self-blame is cruel, and worsens the cycle of the illness. Self reproach definitely makes it worse. At some point, some serious self-forgiveness is necessary to interrupt the cycle. You have to break that downward spiral…the chicken and egg of negatively overthinking your situation. When a stone breaks – it loses its original value – but energy is released, and we find ourselves adapting to the change as having been meant to be. But let me sit with the badness, for a moment. 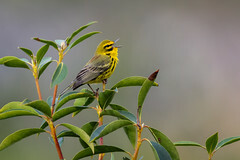 When you get sick, your body – the rock on which you stand daily – falters. Of course it’s worse with a more serious (or chronic) illness…you lose faith and trust in you. That basic tableau – within which everything happens to and through: you – it’s no longer what you’ve come to expect, it’s not reliable, dependable. The rules of engagement have somehow changed, and it doesn’t seem very fair. No, indeed – the Russian Roulette of illness and Death are not fair – our goal is to hedge our bets with prevention and treatment. Taking this statement further – many of believe we live in a universe governed by a benevolent G*d, but whether jealous our merciful – G8D cannot give us our way 100% of the time. We are each the center of our own reality, but in fact, we are all peripheral to the greater REALITY (and thus, not particularly entitled to any special treatment). This is a bitter pill to swallow, but the sooner we make peace with it, the sooner we can have a more balanced and ultimately respectful view of The Creator. So back to our compromised self. Being sick is a very damning state to be in – because as a body – if you can’t count on your own being, what can you count on? Your weakened state throws everything into question. You become alienated from a generally beautiful, provident world, and a mostly functional (and otherwise healthy) body. The co-mingling of opposites: is the dark in the light, or the light in the dark? Yin and Yang swirl around one another. Don’t think for a minute that I look at the world with rose tinted glasses. I’ve seen some of the worst, and I do believe we live in Heaven and Hell simultaneously. But like the glass half full or half empty, I believe you can view the same situation in a more positive or pejorative light. For some – and I spent a decade like this (at least) – everything can seem worse, like you’re living in purgatory (at best). And being sick definitely throws you back, deeper into that dungeon. I do believe – especially when I listen to the news (about atrocities committed here and abroad) – that for many, life on this planet, is hell on earth. Back to me, and my immediate answers about what might have contributed to my current situation. One theory, is that I left the fan blaring on me while I slept sweatily last week, and it destabilized my aura (wreaking havoc on my overall metabolism). More than half the people I spoke to agreed that this could well have been the culprit. The symptoms also began the night after I had Chinese food from a restaurant I like, but don’t totally trust the cleanliness of. I do believe that germs from an unusual source can tip the scales. A variety of causes can conspire to make you sick. A third theory is connected to the fact that I tend to overeat. Too much (of even healthy food) can backlog – with nutrients going bad, getting “caught in the filter” – which then require cleansing (or evacuation), through the illness. 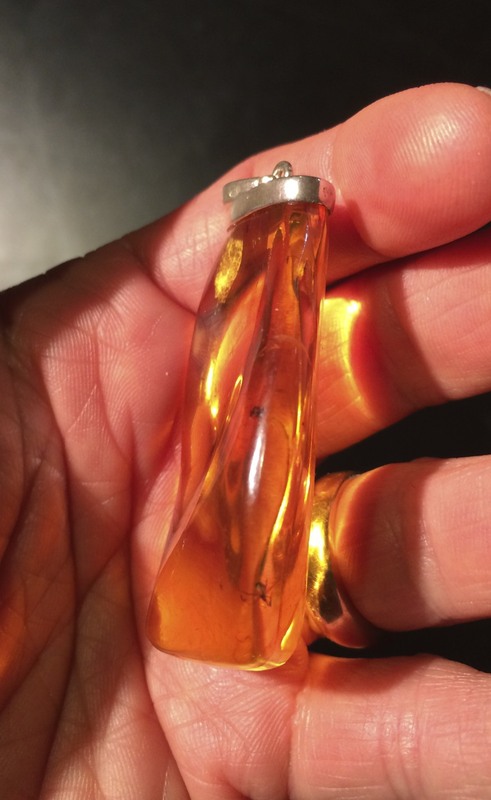 Amber & Jet are light density power stones – and because their weight is less than their size would suggest – they tend to wick away blockage and tightness. Worst case scenario – if the raw material (of what you’re eating) is not that healthy – “the backlog” can result in the inexorable growth of pathological tissue – chronically (or fatally) complicating cellular function, a prime example being inflammation, and of course: Cancer. Whatever the “real” cause of your situation – and, as stated, there can be several – and while disease can often be a fluke of chance (certainly it’s always an unwanted guest with destructive intent) – disease is also, and very often (to its credit) – a healthy response to an unhealthy situation. Let me pause, and draw attention to “the fluke factor” – bad luck (remember?) – s**t happens. 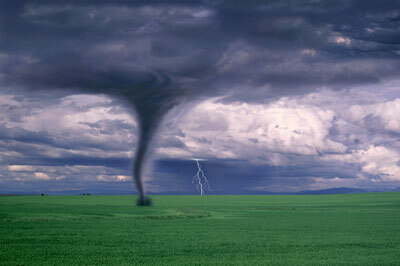 In as complicated a world as we live in, lightning bolts (and tornadoes) do strike. Yes, there can be “favorable” conditions and standing out in a field may be riskier than being in your car. But when that wind starts to blow, can’t nothing stop it. Every natural disaster reminds us how little control we ultimately have. And disease, ultimately, is a natural disaster. So you have to “give unto Ceasar what is Caesar’s” – let go and hold on simultaneously – try that on a hang glider! All and still, just as there are (seemingly incontrovertible) Laws of Physics, a great deal of what happens around, and to us…is logical. What else is your body supposed to do, when you treat it so? We’re too busy to cook or make proper food. We’re too busy to take any time to stretch, or work out (as much as our body may want, or need to). It’s no wonder your physical person develops a grudge and wants to “get you back” for your neglect. All it’s looking for is some R-E-S-P-E-C-T (like the song). 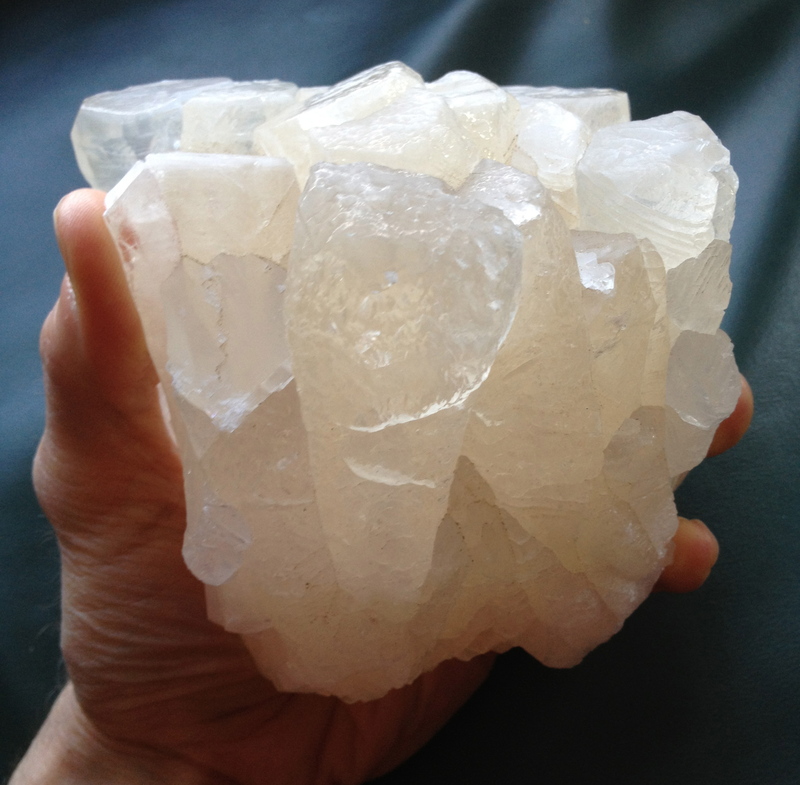 Nirvana Quartz – like Elestials – represents the higher, deeper, more ancient self. Every time you don’t listen to your Soul, you’re stacking the deck against you. And we’re all willing to take the hit – whatever treatment or sick time (later) we need – that’s somehow “worth it” to get those things we need from our paycheck. Well guess what, your paycheck won’t always be there, but your body always will be – and once it’s gone – none of that other stuff will matter anyway. People need to start paying attention, doing everything they can before they get sick (not just after, when it’s often too late). Work, our job, our “have to’s” excuse every mistreatment of our own primary (and personal) system. And yet, if we pause, and take care of ourselves – others, and we ourselves – tend to think we’re being selfish, self-indulgent…the worst…we can’t justify the down time! And also – by behaving like this (taking time out to take care of ourselves) – we’re likely/surely bound to become indigent…because there’s no money in self care. There’s only money in “other-care” – taking care of everyone else – that’s what pays (and has any moral currency). That “other” you’re servicing can be your boss or a client – heck, even (or especially?) 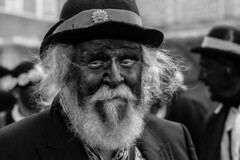 “the man” – as you pay your taxes and comply with the prevailing laws of the land. Would you still be doing what you do if there was no money coming in from it? If the answer is no, you have some serious answering to do to your inner self. We pay the price for our compromises. And then there’s “the children” – the primary conservative force in our world (if you think about it) – why would we take risks or not tow the line…when we have to look out for, and provide for them…children first (remember?!). People even avoid Divorce on account of children. Not to say that they’re not (in addition to saving a primary relationship) worth it, but to demonstrate the fact that self denial (for many reasons) is woven into our own very individualistic and narcissistic (in other ways) culture. 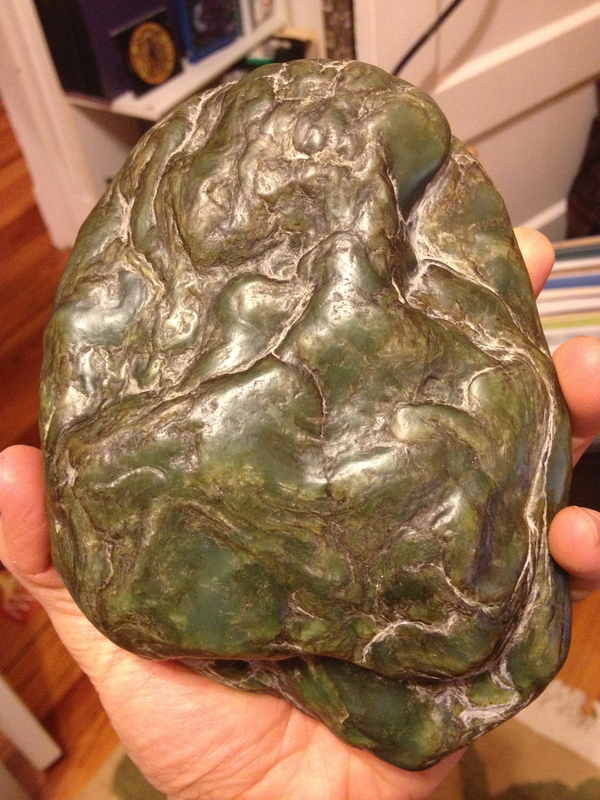 Nephrite Jade – particularly water worn by nature – is the ultimate emotional soother. It’s like: we’re being goaded to take care of ourselves – in ways that make other people money (like through cosmetics, sports clubs, the clothing industry) – but not necessarily in ways that may cost nothing, but still achieve the desired effect of personal, lasting gratification, or satisfaction. They say the personal is political – it’s true – the world feels more holistic (to me) if you can see how you connect beyond your self, right out into the Universe (another benefit & practice of my Crystal Concentrics Meditation). Maybe there’s nothing you can do about it – your problem, or the world’s problems (or so you think) – but be honest about what you could really be doing (but maybe aren’t), the ways in which your hands feel tied, how you’re stuck, and how that may be impacting your health and well being (never mind that of the planet). Foggy, or Girasol Quartz is a unique variety – it represents the unknown – and the unknowable…an important factor to consider…and be in the presence of. Suit yourself – however shallow or deep you want to look – if everything happens for a reason (“the Fluke Factor” aside, though even that is an omnipresent reality to contend with) – I think it behooves us dig a little: explore the metaphysical context of your situation. I’m saying (on top of all the types of factors already explored): it could be evil spirits at work; it could be your own past lives catching up with you; the possibilities are limitless. There’s also “the Fog Factor,” which is that it may not be for us to ever figure out what’s happening, exactly, and why. In any case – I’ve gone off on a few (relevant) tangents – I want to bring the conversation back to my own process…regarding the illness that’s come front and center…into my life. I’m banking on it’s being metaphorical for you and your own experience of illness, which could be more than informative…I’m hoping educational…in helping you think about (and hopefully improve) your own situation. The purpose of this Blog is to be relevant, to apply, and to be of more general utility beyond my solo journey and meanderings. What I realized – especially early on – is that the illness is not the only game in town. When it first was settling in, I saw it coexist, and in context, relative to the rest of me (which was not in duress). 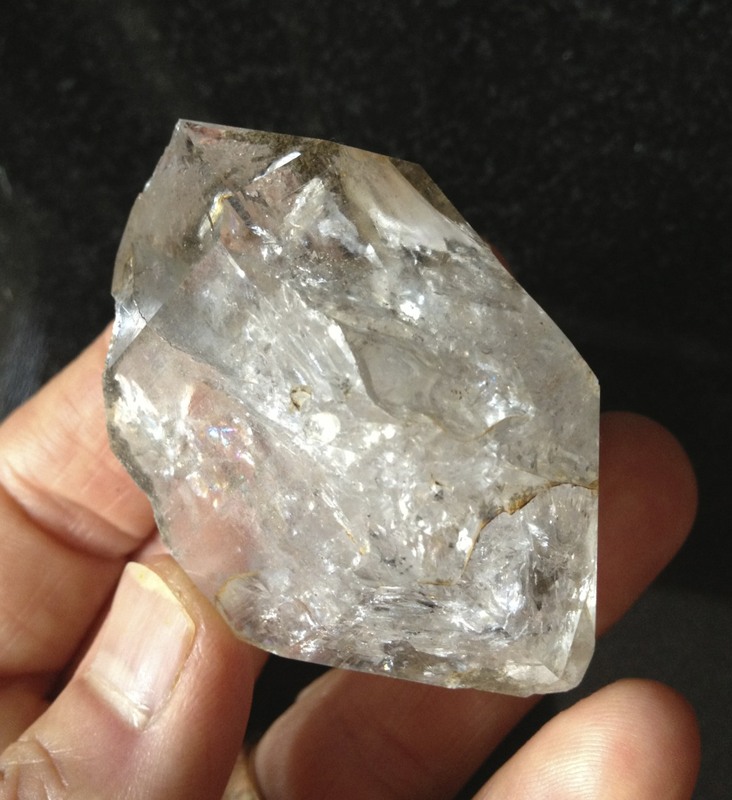 Herkimer Diamonds are the picture of health – impenetrable – allowing light, but nothing else, to pass through. Holding a larger sense of healthiness and positive continuity, makes being sick more tolerable…gives one hope…and gives you a sense that even if not in the moment, you will overcome. Yes – your throat may be burning, or you may have a tumor – but there are another x-billion cells doing just fine…let their voice be heard. 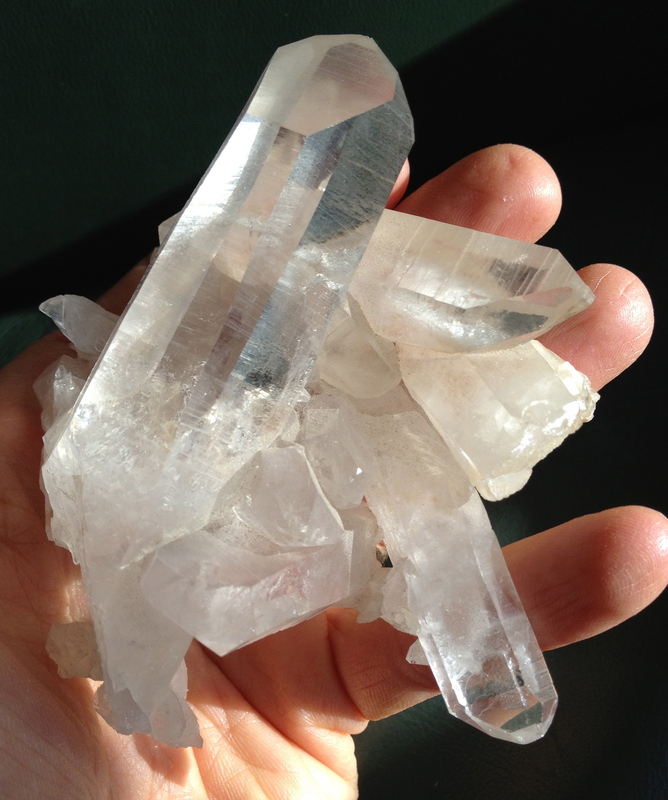 I’m remembering my Crystal Meditations, in which we take time to center into the body – that really helped me to acknowledge and get in touch with those other, healthy cells – and call them into play, see and acknowledge them for the good job they’re doing maintaining my overall health. My spiritual practice of being with Spirit-apart-from-Body also helped, because I could know that the Spirit was unscathed by what I was going through – damaged, hurt, concerned, for sure – but somehow (also) immune to it all. I had to have Faith that “this, too, shall pass.” Even now, a week in [which is how long it’s been taking me to finish this blog], while the unproductive cough has sunken deep into my lungs – my capacity to write an account of my experience is an act that will survive the pathology – and I like the way that demonstrates our eternal capacity to recover and/or transcend. Again, the Power of the Word. Look at how much more Anne Frank has impacted people in death than she was able to in life. Not everyone can look forward to such a posthumous “reward,” but by being in the moment, doing the best she could with what she had (and grappling with the demons that presented themselves at the time)…she created something more valuable than she could know in the moment. 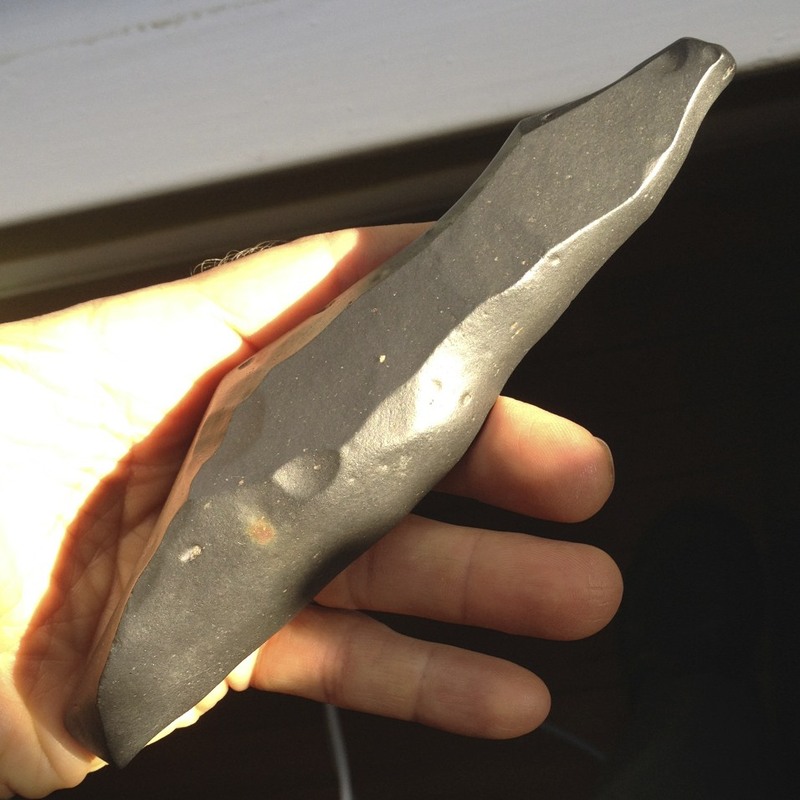 Basalt – one of the more ancient of stones – here shattered and was polished by the wind & sand over eons, to make a ventifact that is powerful in clearing and protecting. I’ve never been one to painstakingly plan and strategize – I, too, put one foot in front of the other – try to make for the steadiest footing that makes sense (and feels right, in the moment). My vibration is very steady – though I see what a flash in the pan I am, on the grander scale – which is why I like the Stones…they go on forever. 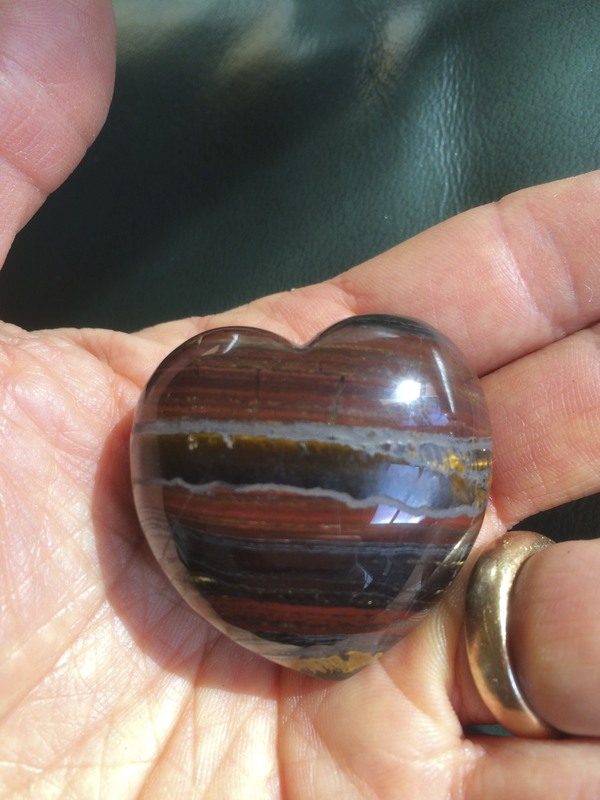 Indeed, while we are so very fragile – and can sometimes be challenged to find any part of us that is steady and sound – Power Stones are there, if we allow them to be…an extension of ourselves (and Creation)…that is solid and eternal. Some people use Religion for solace – and I do too – it surely has its place. And I’ve argued elsewhere that the two are not incompatible. But what I like about the mineral world, is that it both precedes our human experience, and it will outlast us…making it somehow more elemental than anything we could dream up (through our various cultures). By associating with the mineral world, we borrow some eternity, draw from its strength, and share in its capture of Life & Creation energy. So have I used crystals to get well? I mean, isn’t that the point, to use them for our service? Yes, and no. 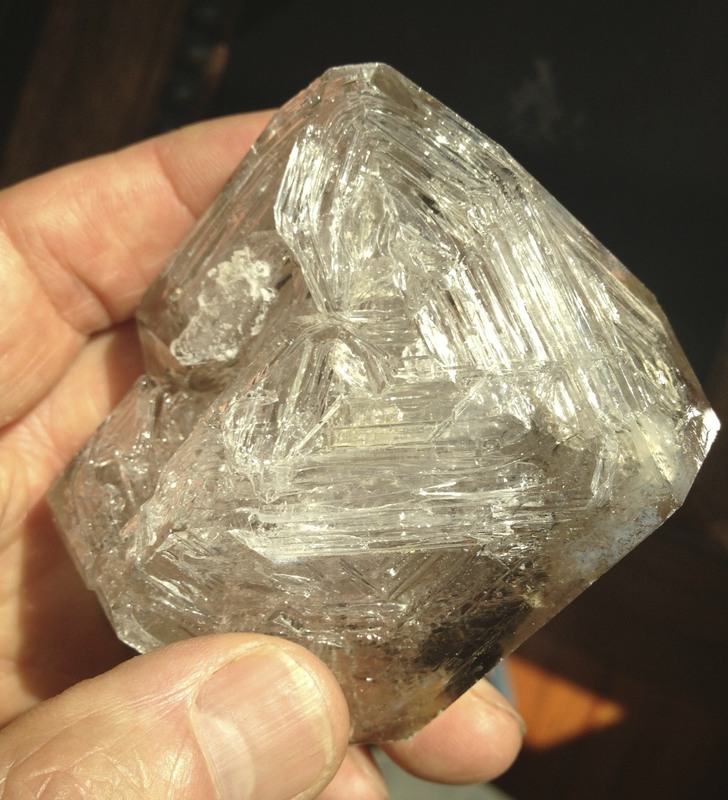 Crystals are not tools, like guns and scalpels, created exclusively to do our bidding. That is a beef I have with “the literature,” which seems to suggest as much. It’s the whole Biblical thing about us having been given dominion over all things earthly. Yes, that may seem so – and is a power that we have – but it’s also a responsibility, which people don’t tend to grasp, or hold onto as well. 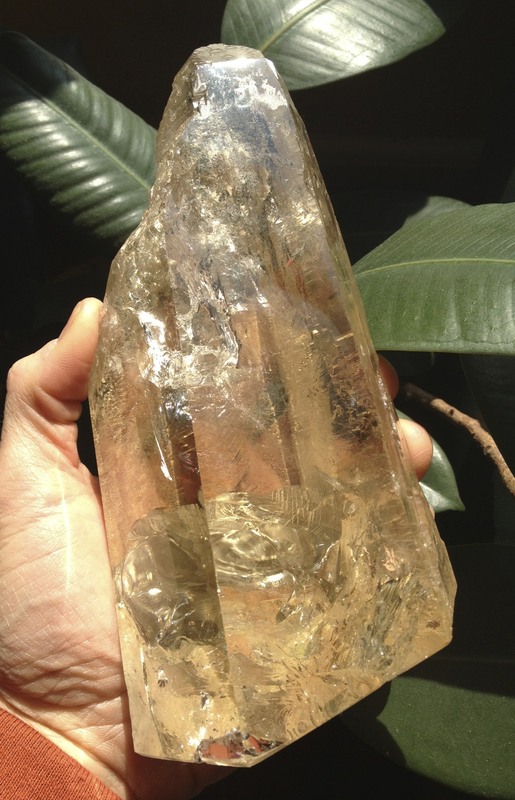 Large, beautifully terminated Topaz – the intrabody neural communicator – facilitating your body talk and internal functioning. Everybody wants the easy part, the quick fix, which is why I don’t give “crystal prescriptions” – “you have this problem, take/use that.” It’s more complicated than that. And also, I’ve had a major breakthrough, in terms of understanding how Crystal energy work is not, nor should it be compared with Medical work. Indeed, this is also why I don’t believe in gem elixirs – because I don’t think they should be ingested – that is the role of other substances (herbs, medicines, food). An important distinction must be made between physical treatment and metaphysical treatment. They are not, nor should they be, compared or used in the same way (or for the same purposes). 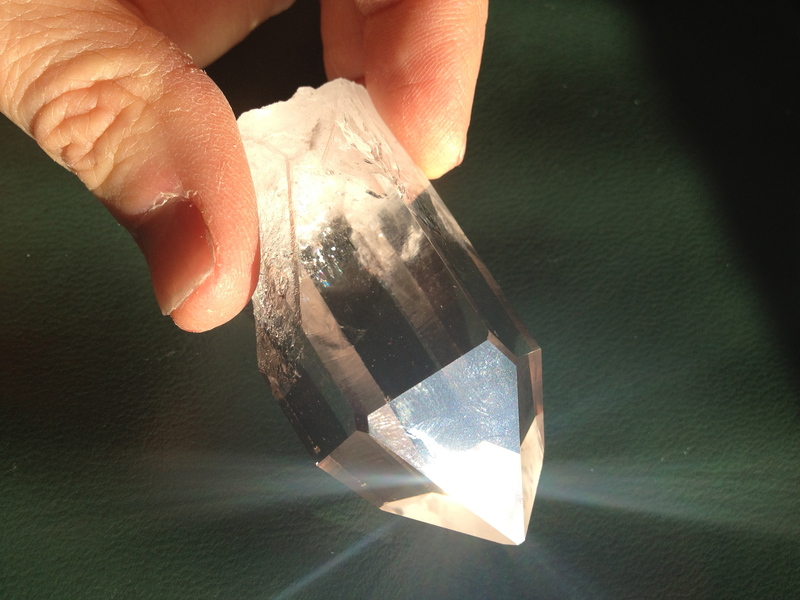 Crystal Energy is meant to be seen with the Eye – interpreted and working through the Mind, or Imagination – and looped through the Body via Touch (the cycle). Science is the wonderful art of identifying and working with the recurrent, visible laws of Nature. But not all such laws (of the Natural World) are consistent, measurable, or tangible. The metaphysical world may never be quantifiable in the same way, which is why I have no agenda for bringing Crystal energy into the mainstream, through scientific justification…can’t be done…and shouldn’t be. In the metaphysical world, the law is often that there is no law – that we can see and perceive tendencies and subtleties – but that Reality is relative, subjective, untamed. We can coax it, shepherd it, but it goes its own way, in its own time. The myth of control has been debunked. I take my remedies (and there are many): steams, elderberry, lomatium root, food grade vitamin C, echinacea, cranberry juice…the list goes on…and they all did their thing (heck, even aspirin helped!). But in the absence of a trusted Crystal Healer, I had to rely on all the previous work I’ve done with Spirit, to tide me over, and give me strength in my weakness. I feel too many (most?) people reject, or pass over the potential of working with a true energy healer – because they want the tried and true – and don’t want to take chances (or make changes). I notice they mostly don’t want to look at “their stuff,” or do the hard work of going through the valley to get to the other side. 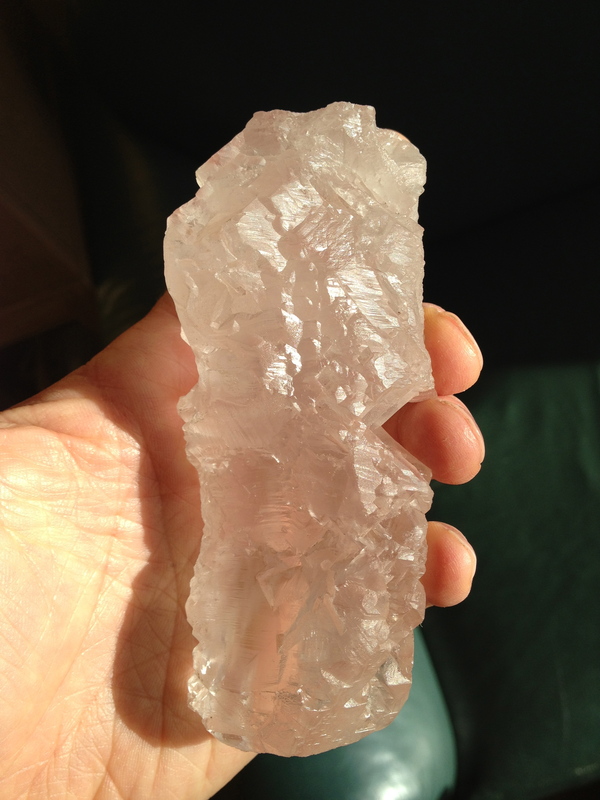 My work ultimately has to be demonstrating why and how it’s worth it (to work with Crystals). Alas, I have not trained someone else to take my reins, or do what I do (yet). But I’ll keep on keeping on. Bit by bit, these blogs (and my eventual books and other publishing projects) – as well as the events I host (live and online) – as well as my showcasing at Expos, will together put my footprint on this important area of human endeavor. Were it a bigger, life threatening illness (this pesky cold/flu), I would have wanted to have some energy work, for sure. Being very independent, and untrusting of authority per se, there are very few folks I’d trust or want to work with (or “on” me). I’m leery of generalizers and “false prophets.” So my memory and source work with Crystals has had to carry me through, until such time as I can work the gears and have the Soul energy flow again, unfettered (and uncomplicated). It’s helpful to know – it flows here, right beside me, through me – even when I don’t see it, or feel it (cause I’m so busy feeling crummy). I’m reminded again of the response a spiritual leader gave my son, when he (my boy) confessed that he’s not sure he believes in G8D: “that’s okay” he was reassured: “G8D doesn’t mind” (the assumption being that G8D is always there, whether you see him/her, or not). Our role is not to question or even to seek the Universal Life Force (per se), but rather – to simply let it be (it’s all around, and within us)…to let it flow through us. Stop trying so hard. You wouldn’t be here if you didn’t “have it” already. Independently from applying meaning or causality to your illness – to have it “make sense” – we often hear folks saying their illness (regardless of the cause or outcome) has taught them something, and for that they are grateful. Malachite – “the emotive” – demonstrates the wending ways of Feeling – and helps allow you to access and express your inner knowing. Had I not gotten those 2 bouts with Cancer, I would have never changed my diet or thought patterns, which I think would have done me in the third time around. Hitting a dead end forces you to make a turn, take a new path. Being sick now – and stuck somewhere without Internet – has enabled me to capture these words in a way that feels more relevant because I’m actually going through some real discomfort (and an extraction from my element) in the moment. My hope is that you’ll be able to make some sense from this collection of thoughts. To review – I have explored some of the things that happened, which “put me at risk” – as well as the lessons to be learned, including a discouragement of self-blaming. It’s good to correct your course, and know where you’ve gone wrong, but beating yourself up about things will not fix them. I’ve discussed the Fluke Factor (of chance) and the Fog Factor (of uncertainty), as well as the need to connect the microcosm with the macrocosm. Avoidance does not really serve you, nor do excuses, however good they may be at distracting you from your path. Try to see the good within and around you, and draw strength from both. The world does not revolve around you, but you should certainly hold your place in the merry-go-round. Reach out and seek healing, from allopathic and alternative sources, they’re all here to serve you. Know that there are limits to control, and that ultimately, our fate is in the hands of forces much larger than we can imagine. Enjoy Life while you’ve got it! 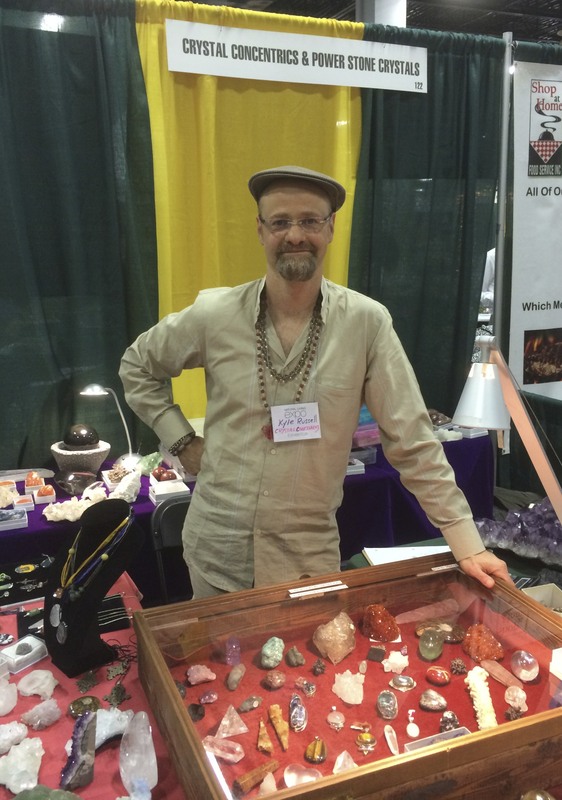 About the Author: Kyle Russell has been working with Crystals for over 25 years – inducted into working with them through a supernatural experience – but building on the knowledge and evolving it through sharing…via in-person and virtual offerings, including an extensive social media presence…and a growing, written record of his thoughts and observations. Feel free to reach out to him, and learn more about his Awareness, and how it can help you. Email Kyle@CrystalConcentrics.com. There are 3 gateways into ourselves: through the Mind, through the Heart, and through the Body. Crystals are experienced the same way – by touch (through the Body); how they make you feel (the Heart) – and via what you think about them (the Mind). I have identified 3 stones that (to me) embody each gateway. 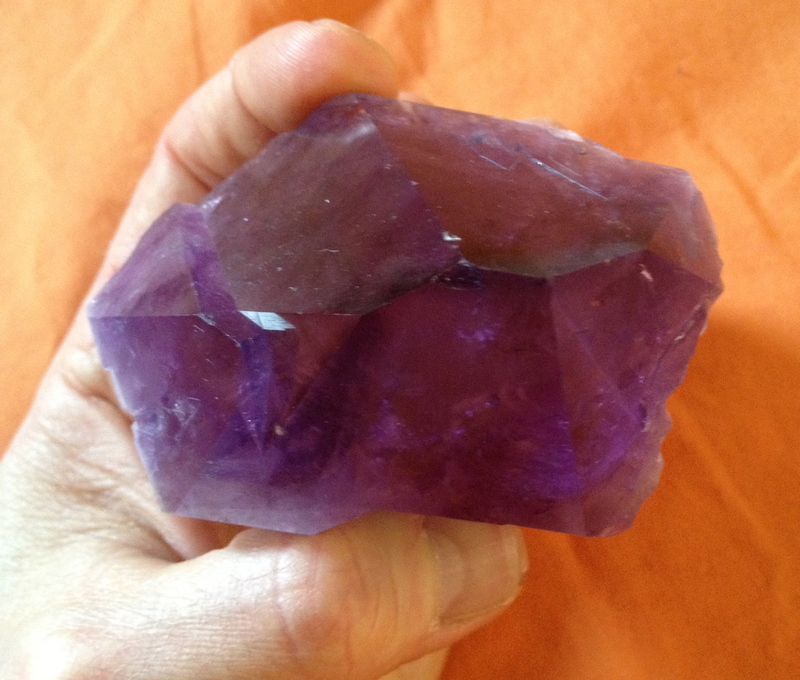 Amethyst is one – for its power to represent Spirit – specifically in “point form.” I’m talking about a point as separated from a cluster. Clusters have a different function, to act as Spiritual Cleansers. 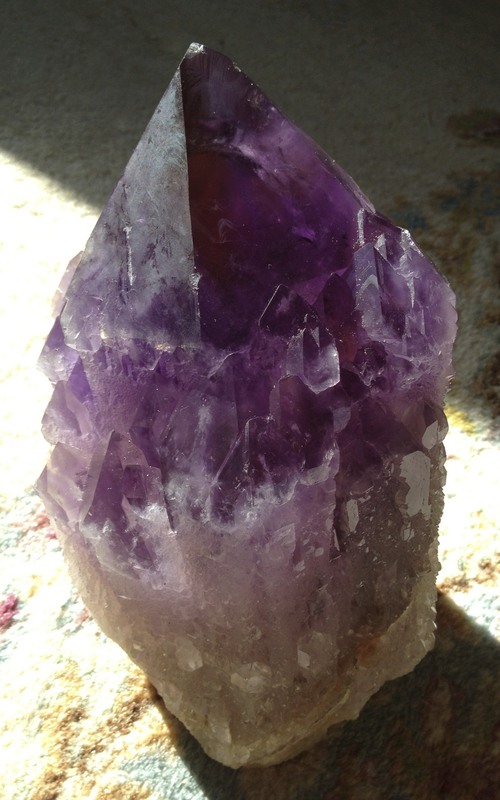 Amethyst is the ultimate Higher Mind stone. This is true because it speaks to the connection between Self and Spirit (and how mentality bridges the physical self with the self-conscious, abstract “seer”). What is your true mission in life? What is your Higher Purpose, or ‘true’ Destiny? These are the types of questions to contemplate in the presence of Amethyst. These may seem like lofty (or irrelevant) – to those who are not inquiring deeply (and for whom mental considerations are not bound up in spiritual matters) – but folks for whom the Mind is two dimensional, are trapped in a more earthly consciousness. I don’t blame them, but theirs is not the place to judge those for whom these explorations are significant. I don’t mean to insult the Earth by using “earthly” in a derogatory sense, but you get what I mean (I hope, and if not, read on). Earthly (with a small ‘e’) connotes petty, provincial, non-Global or unconnected awareness. Earthly (with a capital ‘E’) gets into the vast (and deeper) grasp of Terra, terrestrial reality, and it’s connectedness to the all other dimensions, elements, perspectives, and The Universe at large. Our thoughts, even (and often?) about grander goals and meanings – are immaterial – that is to say, they’re not solid, physical, or tangible. Indeed much of our reality – far greater than most will admit – is virtual (hello: the Internet is not something we can touch). 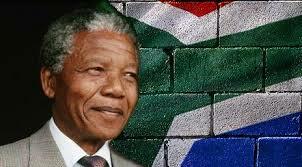 Great in their influence are the unspoken, evocative, and symbolic…in all cultures. And yet these thoughts, symbols, and archetypes can – and do – manifest quite tangibly in our world, particularly when they result in actions and consequences, as they constantly do (all around us – in the news – in our lives). If the universe was created from a word – and words are merely symbolic – then truly, it can be said that our co-creation of the present and future are bound up in our understandings of (even unconsciously) – and relationships with – abstract conceptions. The metaphysical is intrinsic, it’s everything, or at least on par with everything you can take in with your 5 senses. Those who say otherwise, are living with their head in the sand. It’s time to come out and play. It’s time to have a more nuanced, and inclusive perspective on Reality. Indeed our failure to think grandly manifests by default in our permission of the world to remain in chaos, or at the mercy of (mostly human) neglect and species-exclusive abuse of the planet. In the Healing realm, long distance healing is a good example of psychic action taken – on a higher (or different) plane, which can produce outcomes – or influences situations remotely. Someone grappled recently – in public (at a conference I attended), and with humility – about “how does distance healing work?” She knew it did, but was unable to explain why (or how). In the interests of this Blog (and getting my thoughts out on it now, as opposed to later (when I could devote an entire Post to it), let me take a stab at delivering an answer to this beguiling question. All things are happening simultaneously – connected by coincidence (if you’re atheistic) or by design (if you believe in a Higher Power) – but (even to a scientist), they are inarguably happening coterminously [look it up if you’re not familiar with the term…it means “in a way that is right up next to everything else”]. However you imagine what causes what, everything in the present is connected inextricably with everything in the past and future. 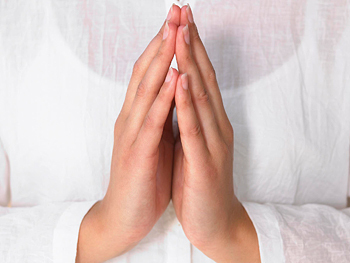 Therefore, it is not unreasonable to expect that my prayer and intention here – can effect your status and experience there – on a Spiritual and/or physical level. I’m finding that the rules of engagement – or what one can expect – in the waking world, is quite different from what might apply in the Dream State (or while you’re asleep). And that’s just two important planes in our life. There are more (even how vastly different my reality and perspectives are from yours). So we cannot begin to claim that the rules of Physics (or Science), such as we may consider ourselves to know them, apply in the same way in all dimensions. “Everything is Relative” – right? Enough [pertinent] digression! Back to Amethyst. It sits on the throne of Purple. Purple is a regal color of Spirit – and in the spectrum of colors – as they manifest up through our Chakra system…it’s towards the top. 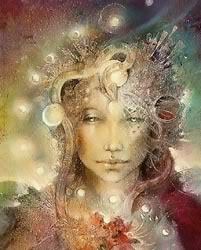 I consider it the gateway between the Conscious Mind and the Spirit (or oversoul) Mind. I believe that Shape, Density, and Color (the 3 gateways into understanding Crystals) are each of paramount importance in identifying (and “riding”) the energetic wave, function, or offerings of any given Power Stone. 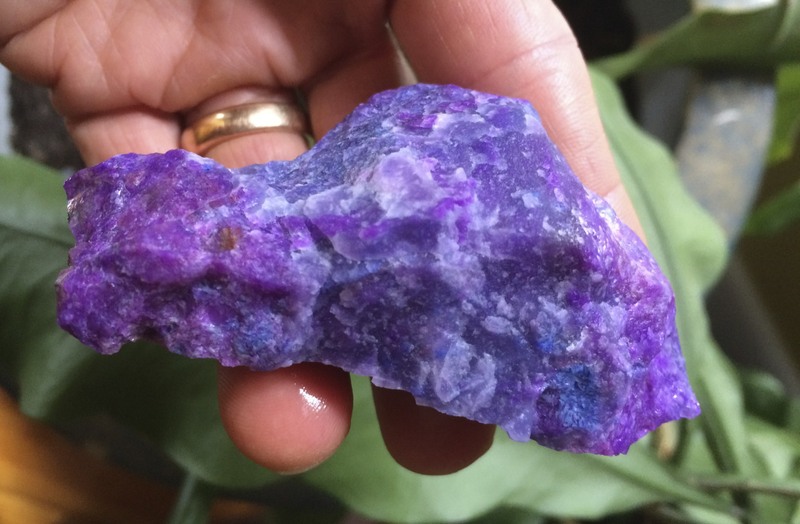 I’ve defined “Power Stones” in other places, including in my “What is Crystal Healing” webinar, but suffice it to say here…how a rock presents itself can make all the difference. Imagine all things (or situations) as complex manifestations of G8D. How very different your lying down, nearly naked in one context – a beautiful thing – can be from the next situation (where threat and terror pervade). How different the appearance – face to face – of a rabbit may be from the appearance of a Grizzly Bear on your path, hiking. Appearances are everything – and sometimes nothing – just flimsy veneers over deeper truths. So it is with stones. Are they are rough or polished? Are they in clusters or in points? Are they large or small? Heavy or light? The answers to these questions all matter. To learn the language of Crystals, is to know how to interpret all this vital information…and how to factor it in to determining its potential impact on your life (or on the lives of others). You also have to look deeper – be sensitive to the fact that the same piece might have different influence in the day than the night – or in the context of other Crystals. In short: “it’s complicated” would be its “relationship status,” which is why I abjure pat prescriptions of “this crystal for that situation” (way too simplistic). 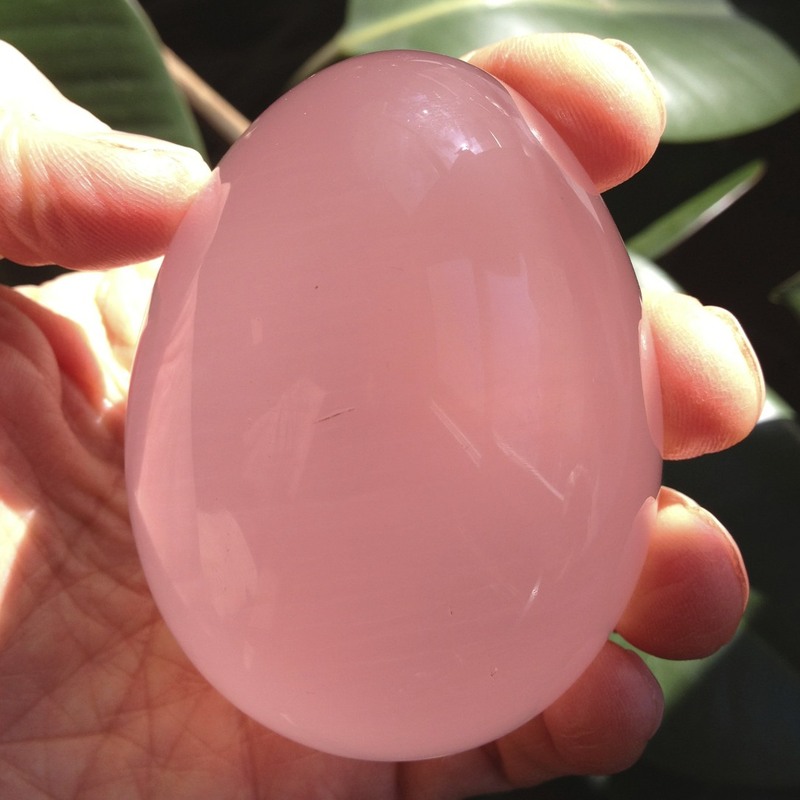 Now about Heart – we think of Love [Unconditional Love is the essence of Rose Quartz, pictured above] as being the ultimate expression of the Heart, and it is – but imagine Love as the gift…what is the wrapping, or better asked…what is the door (or gateway) through which Love travels? Compassion is that sensation, the context – the realization that another’s feelings matter – or that another being is significant. Without that, it’s hard for true Love (or True Love) to be expressed. That is why I don’t identify one stone for “relationship problems” (or prosperity, for that matter)…some of our wishes and aspirations require further inquiry, and broader definition…to be tackled and addressed appropriately (and in a more sophisticated way). There are no silver bullets, easy solutions, or panaceas. Back to Love. How authentically can we love the calf in the barn yard, knowing it will soon be slaughtered by our own hand? Is it not Compassion that leads us to send money around the world, to those less fortunate than we? Compassion of the Heart – has much broader implications for the whole of Creation – just as Broadness of Mind (as discussed above). 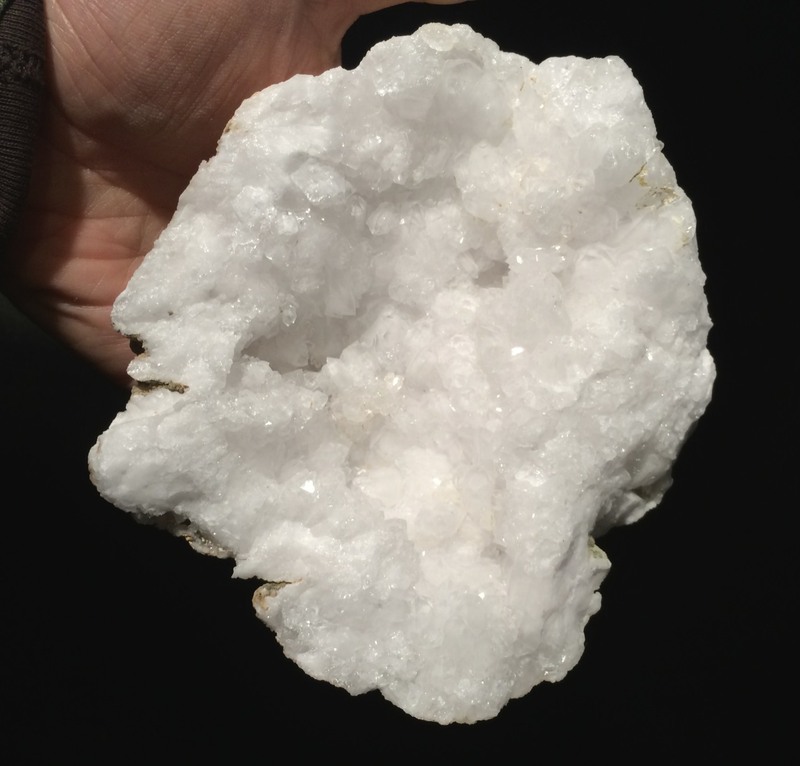 Milky ‘glitter’ Quartz cluster often manifests perfectly the geological embodiment of our concept: Compassion (and/or Nurturance). 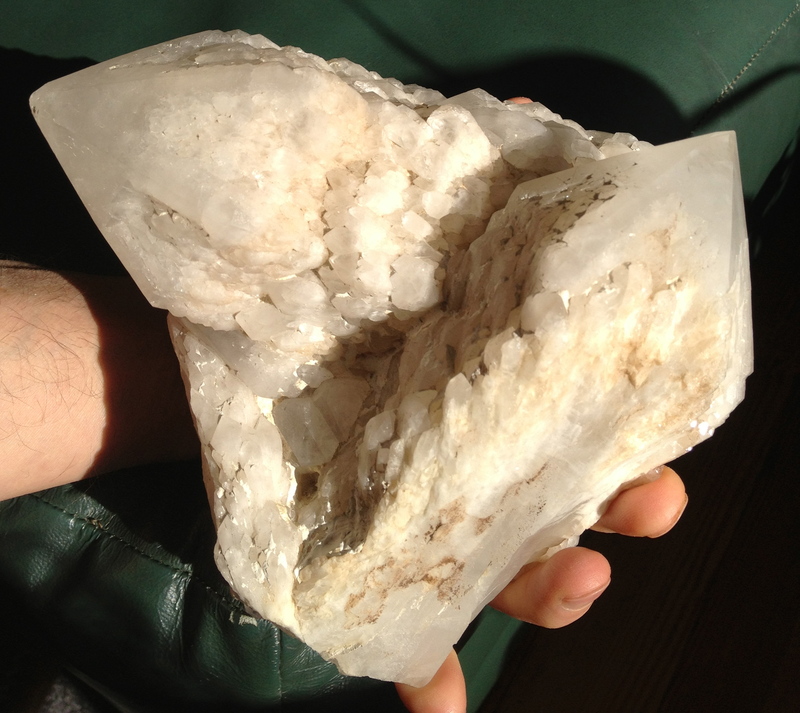 What stone manifests the energy of Compassion better than Milky Quartz? Wait, where’d I come up with that? It seems like an arbitrary association, or claim. Not at all. Let me explain. As I’ve said, there is a language to understanding Crystals, it’s just a question of exploring and understanding it. As mammals – we are nourished by mothers’ milk – and even if we never knew our mother (or she was not nurturing), that symbolism…of mothers’ milk as sustaining life-breath…remains imprinted in our DNA. Note: a visual/conceptual archetype ripples through our being. I used the word “breath” – air is free, we breath without control [though some of us chronically under-inhale] – it’s not optional, and it’s everywhere. Mothers’ milk, however, is sometimes withheld (even not intentionally), due to will or circumstance. As babies, we cannot express ourselves precisely, our cry might be about a hundred different things…and yet the mothers’ breast (or milk, from whatever source) in generally soothing. What is the connection between this soothing nurturance of mother’s milk and Compassion? Not everyone receives it, it is specifically for you. You have been singled out as both deserving and needing of this reward and life sustenance. 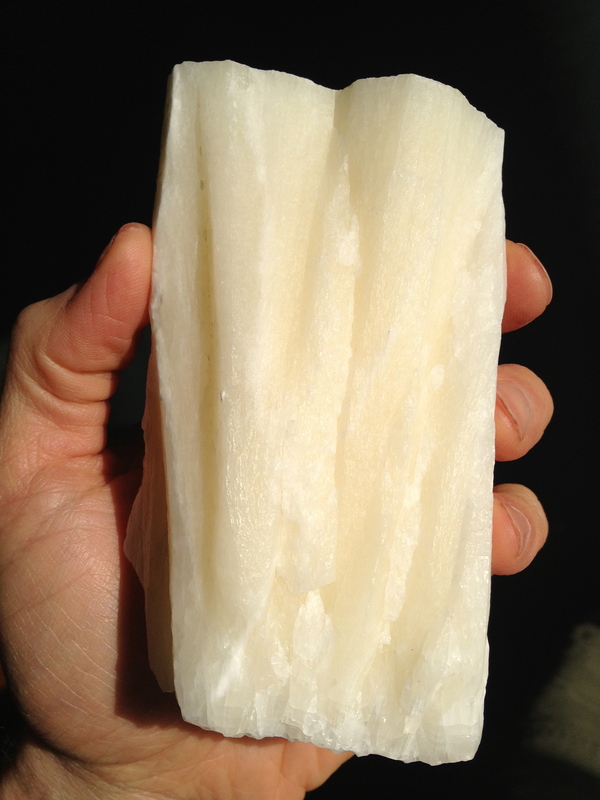 Mountain Aragonite, demonstrating that non-Quartz varieties can also manifest The Compassionate One energy. A mother (more than just about anybody else) has a uniquely developed (or ought to) capacity for Compassion. This is why if mother’s ruled the world, they’d find other solutions than war. The notion of sending one’s offspring off into harm’s way is anathema to any child-loving mom. You’ve heard it said that “there’s nothing like a mother’s love.” The gates of Compassion have been opened up – a mother’s love flows often unmitigated – and so, religions have deified women (just as men have been turned into G*ds, for other reasons). Fertility and the capacity for reproduction and care-giving are just important side effects of a much greater commodity – Love and its context – Compassion. 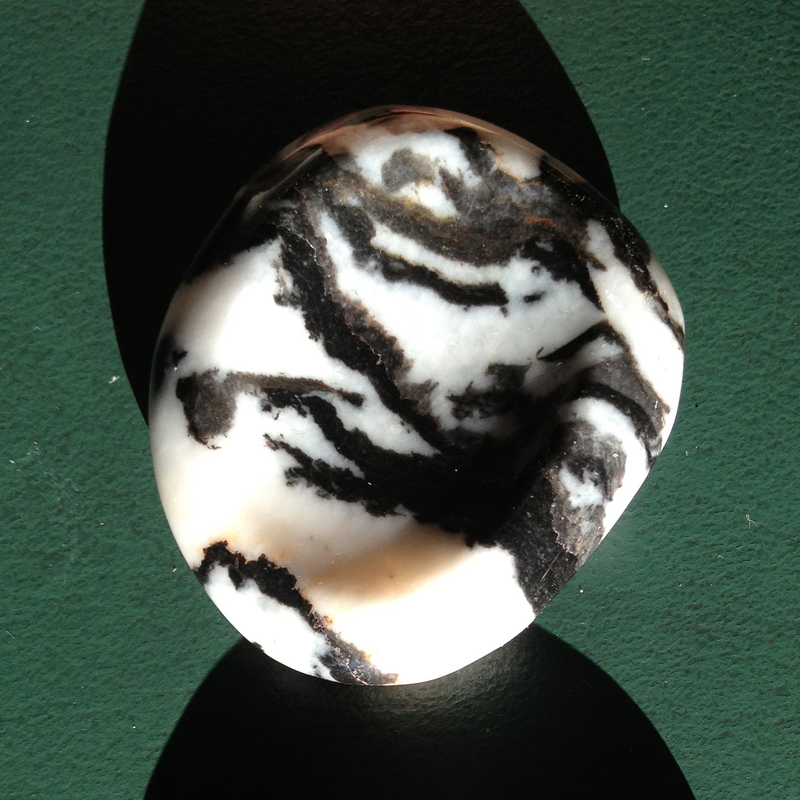 So what if a stone embodied this thing – more intrinsically and naturally than any picture, person – or idol could? What if there was a stone that simply was: Compassion. 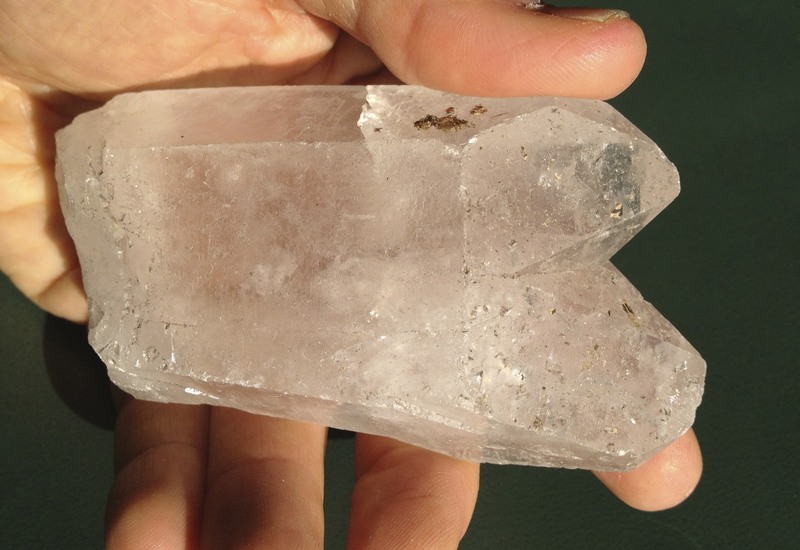 There is – and it shows up as more than just in the incarnation of Quartz – there are several other varieties of stone that carry the Compassionate vibration of Milky Quartz. Each of these three Gateways (to Mind, Heart, and Body) are ‘places’ – which we define through description – as best we can. They are also bridges. The Gateway, Bridge, or Cross Roads feature significantly in most traditions (you can research it, trust me). If Thoughts and Emotions operate in mysterious ways, the Body does as well. Even doctors will tell you this. The same procedure can work seamlessly on 9 people, and then fail on the 10th. It could be a thousand things, including the impact of their Mind, Heart, and Spirit on the situation. But the flesh and blood, that thing and shell we inhabit, is its own world. Citrine is the gateway to the Body. 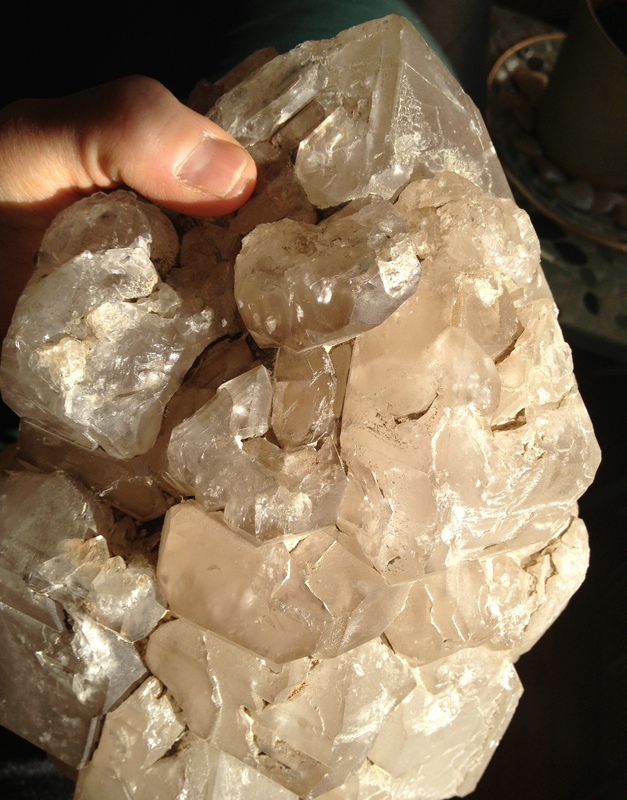 It’s clarity suggests that is not a simply base, massive material…that there is a higher, spiritual component and aspect to it…and we are blessed to have that in geological form. 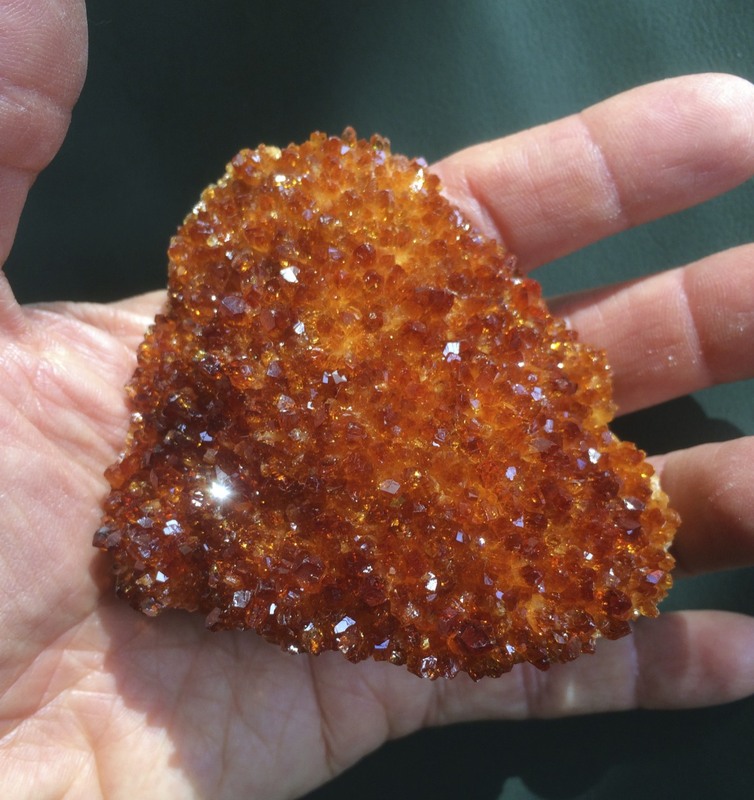 Here’s an interesting geological article all about Citrine. Heat-treated Amethyst, which is what most “Citrine” on the market really is – as with most artificially modified stones – has lost its umph, and is not ideally used on (or to represent) the person. 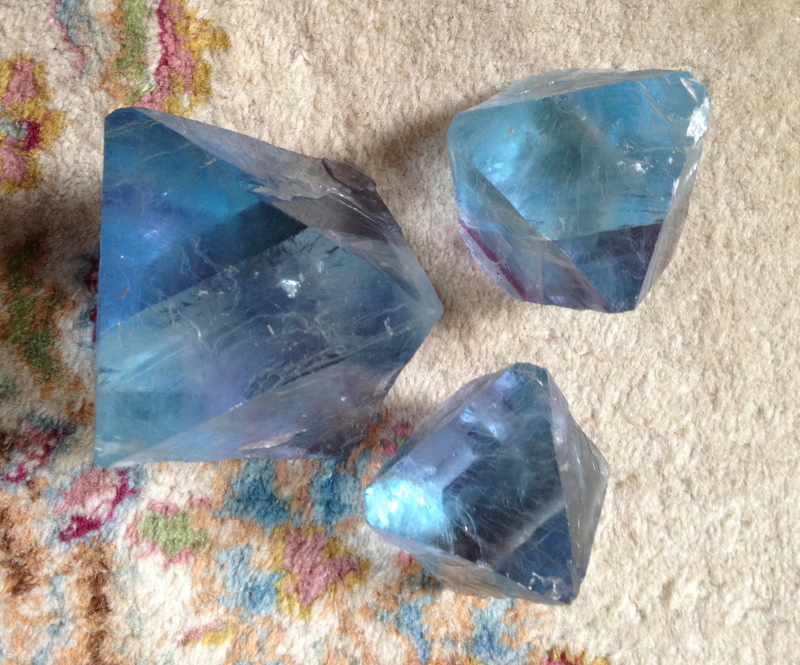 Treated stones – like Aqua Aura – sometimes take on their own unique energies, quite apart from their source material. That’s worth pursuing, but not in this conversation. 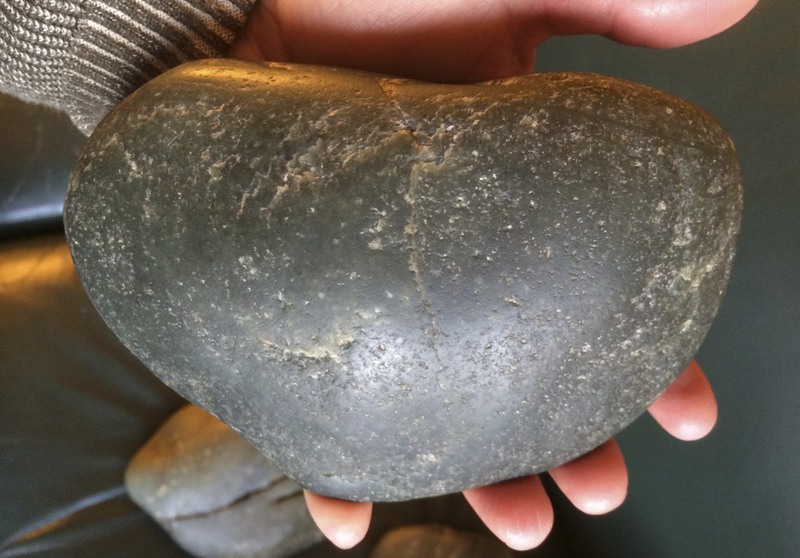 What we’re doing here – and a recurrent theme in my ‘teachings’ – is relating stones back to our own, personal energy systems. That is why I have developed a Crystal Energy Zones poster, which associates 29 Power Stones with our own body. Without getting into all the subdivisions of the Foundation zone (Solar Plexus down through the Root Chakras) – a worthy topic, to be sure (for some future writing) – let me focus further on Citrine itself. 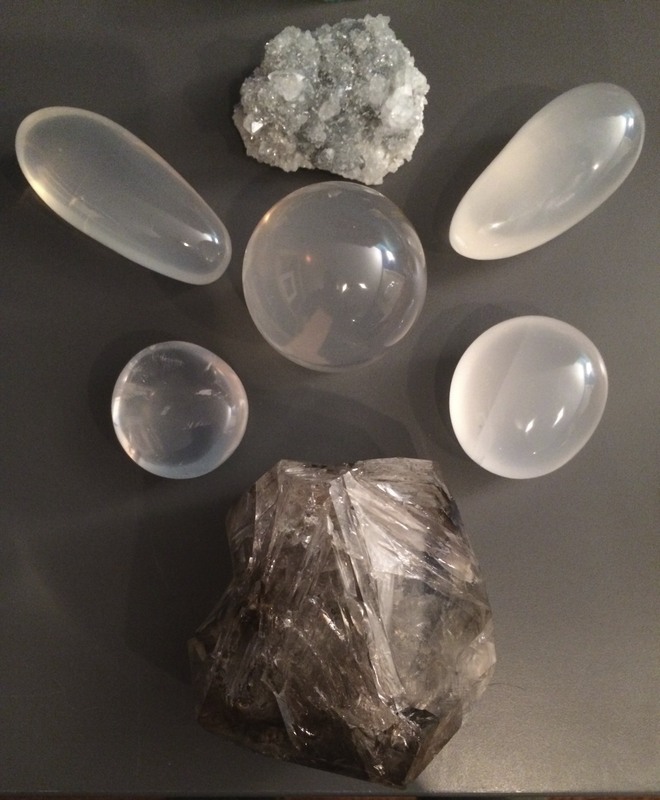 If clear Quartz is a channel (and it’s not as impersonal – or even as effective – as Selenite, in this regard) – and Smoky Quartz is the Ultimate Forgiveness Stone – then Citrine is somehow in between…it represents Ego…in the best possible light. Ego says “I am here” – in the way that our Body does, too – in the way that a superlative athlete can declare their physical prowess (at the finish line, or sometimes without even having to “say” anything). Ultimately, a healthy body walks hand in hand with a healthy Ego. You take up your space without hogging it, bragging, or belittling others. This is the key and gateway to The Body. To understand the subtle and profound message and identity of Citrine, is to crack the code on true communication with one’s Self and physical being. Many splendors lie deeper, in the Foundation – Carnelian, Ruby, Morion Smoky Quartz, even Petrified Wood (‘the animating factor’) is in its domain – but this Blog seeks only to show you the doors…the “3 big ones” (and how they have tangible import, as well as Spiritual significance, and “connections”)…as Gateways to the Mind, Heart, and Body. About the Author: Kyle Russell posts daily on Facebook – sends out Newsletters monthly (and emails sometimes more frequently) – and he leads Crystal Meditations and Workshops. 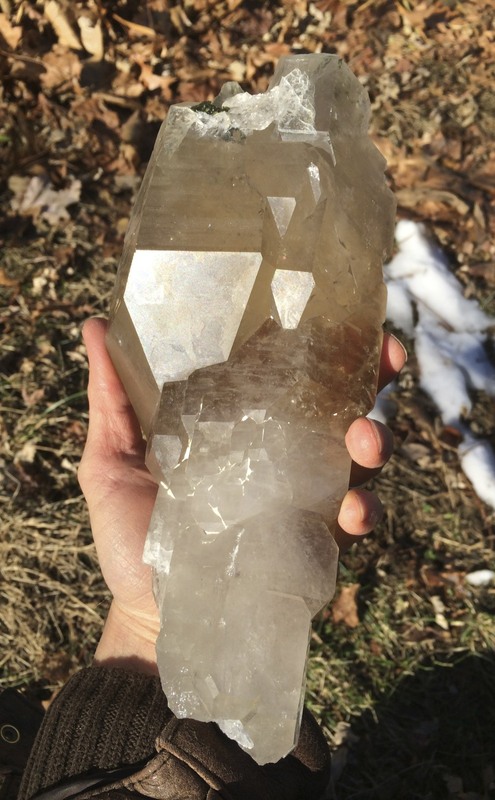 See his Schedule of Events here on CrystalConcentrics.com, and his large variety of fine Crystal specimens for sale at http://www.PowerStoneCrystals.com. 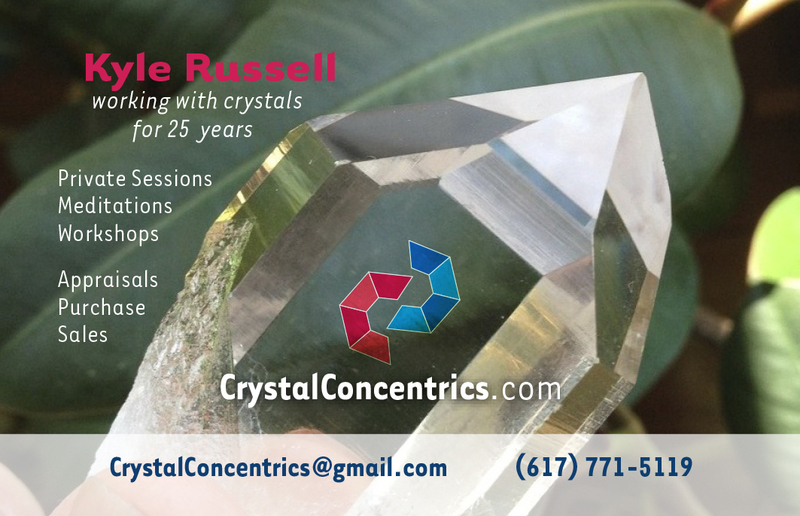 Email Kyle@CrystalConcentrics.com to learn more, or with any questions you may have regarding this Blog, or Crystals in general. What’s Love got to do with it? Crystals and the Heart. 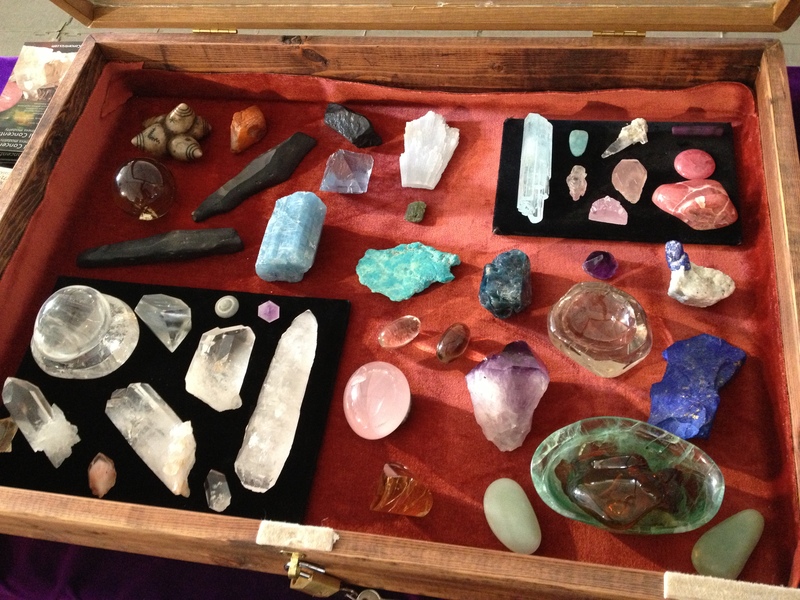 Crystal & Healing are two words that tend to go together all the time. And surely most of us carry around a broken heart, or at least a wounded heart – from failed & troubled relationships – including messed up childhoods. This creates all kind of mixed emotions, and the Heart Chakra (energy center located right there in your rib cage), can be a complicated place. One color – Green – is often associated with that place we call our Heart (according to the preponderance of chakra charts). I’ve added Pink as its logical companion. Isn’t that the color we most often associate with things lovey-dovey (in the West). The distinction I make between Green & Pink is represented by two stones: Rose Quartz & Green Fluorite (which, in its rough, chunk form, looks just like a green version of pink Quartz). 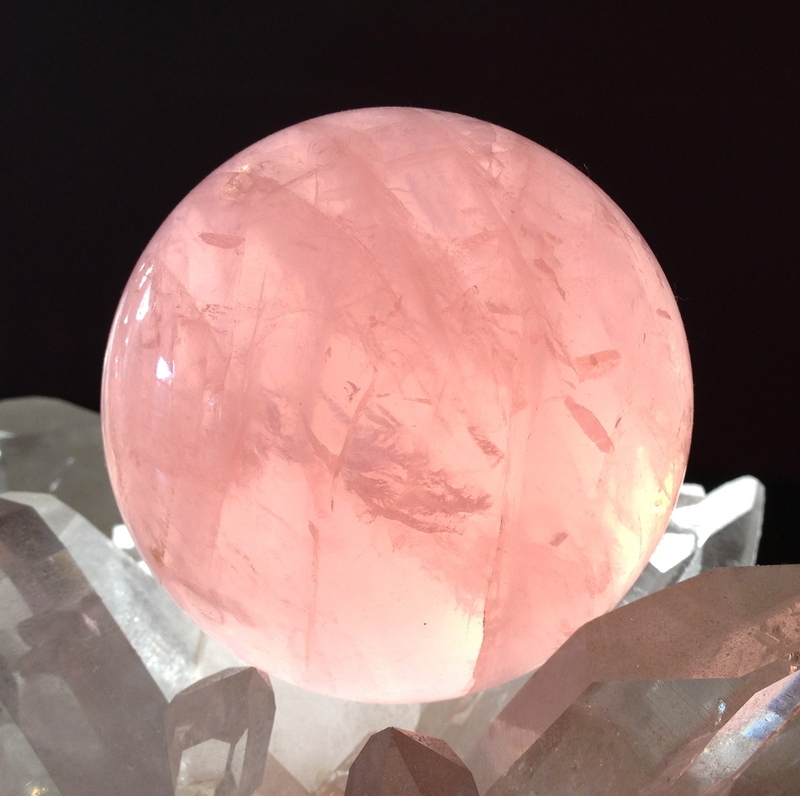 Rose Quartz represents Unconditional Love, the opening of the heart – that vulnerable “first love” vibration – also experienced by the lucky few who’ve had a first hand experience of The Divine…and feel that way towards G8D. It is innocent – not judging – and infinite. 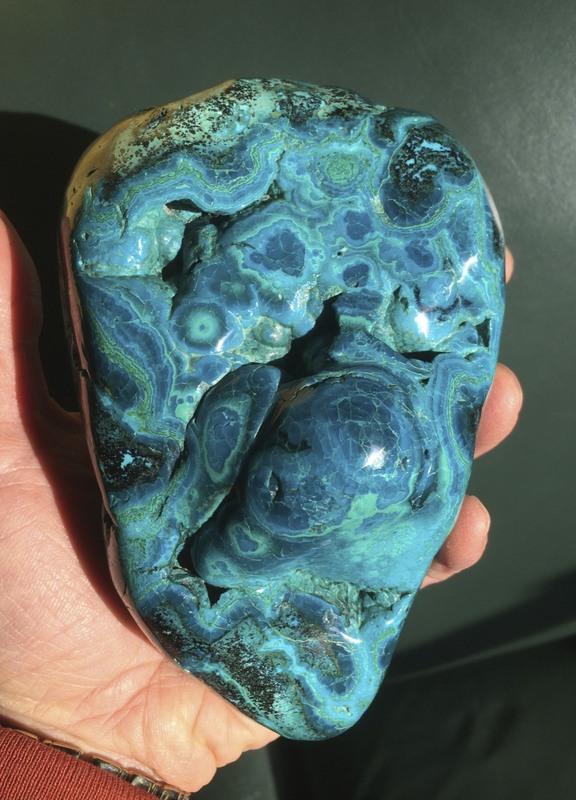 Some people are just not green people, they relate far more to blue, and for them – although this aspect of the heart chakra remains green in color – they’d connect more easily with Blue Fluorite, a rarer, and wonderful form. So you can choose your Blue Spirit world or your Green Spirit World, but blue generally belongs higher, in the throat chakra and beyond. 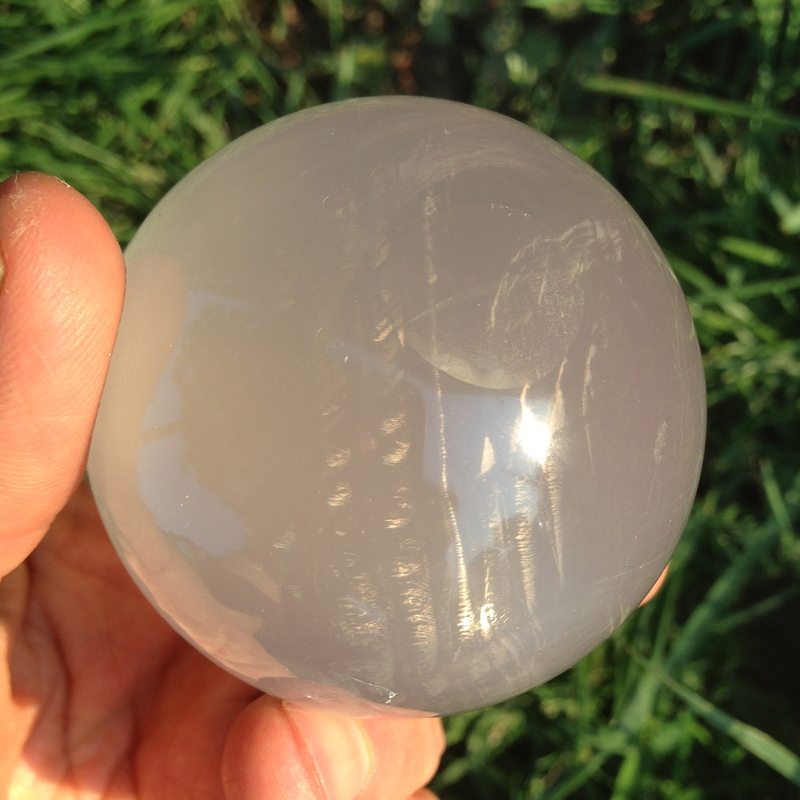 Above “the big two” one could place Milky stones, particularly Milky Quartz (though there are other varieties – specifically some Calcites and Verengita – which is like a white Onyx or Alabaster). These represent most bluntly: a mother’s milk…compassionate…nurturing (which is a bit different from soothing). Next, beneath the Jade, come Smoky Quartz and Malachite. 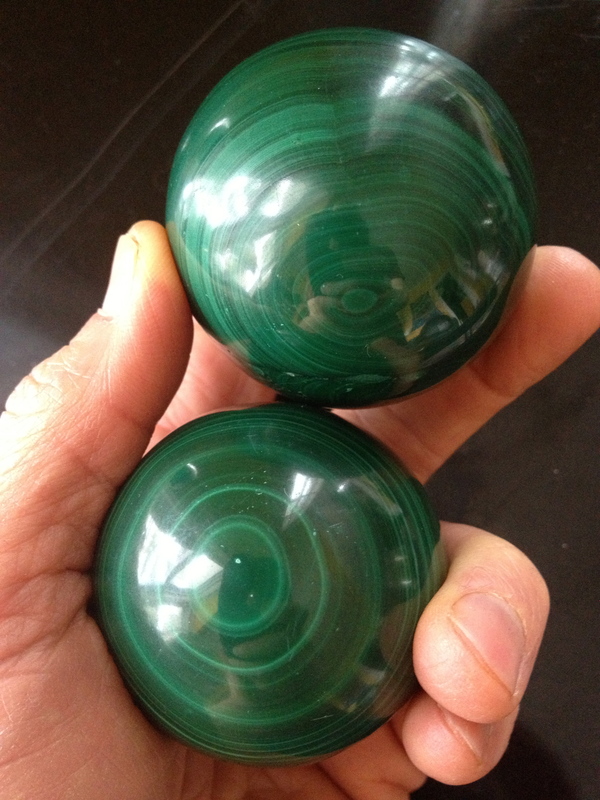 Malachite can be a mixed blessing, because it’s an Emotive. The black represents opening, and the green represents the heart, so it’s an opening of the heart…helps feelings come up…not always an easy prospect. 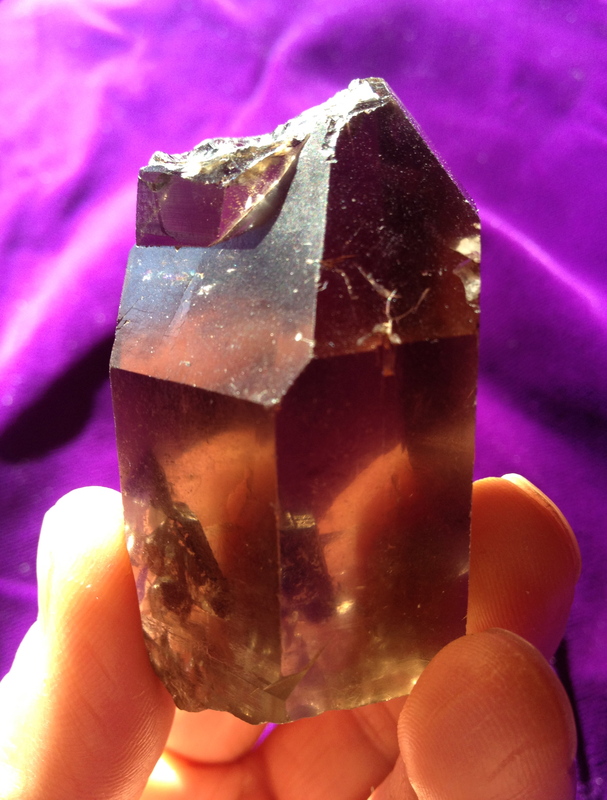 But then, there is the Ultimate Forgiveness stone: Smoky Quartz, here to make everything okay – not by soothing – but by whisking away the negativity, transmuting it into some other place and time. It’s hard to get angry with Smoky Quartz around – I have a large beaded necklace of it – simply can’t get upset while I’m wearing it! So there you have it – the overarching duo of Unconditional & Relational Love – surrounded by other Heart Aspects: the expression of Feelings; Soothing; Compassion & Nurturance; and the power of Forgiveness…all important nuances coexisting in the Heart Chakra…and given voice and language through Crystals. How they are configured, and ‘used’ to treat and enhance people’s experience, is the field of the ‘Crystal Healer,’ of which I am one. 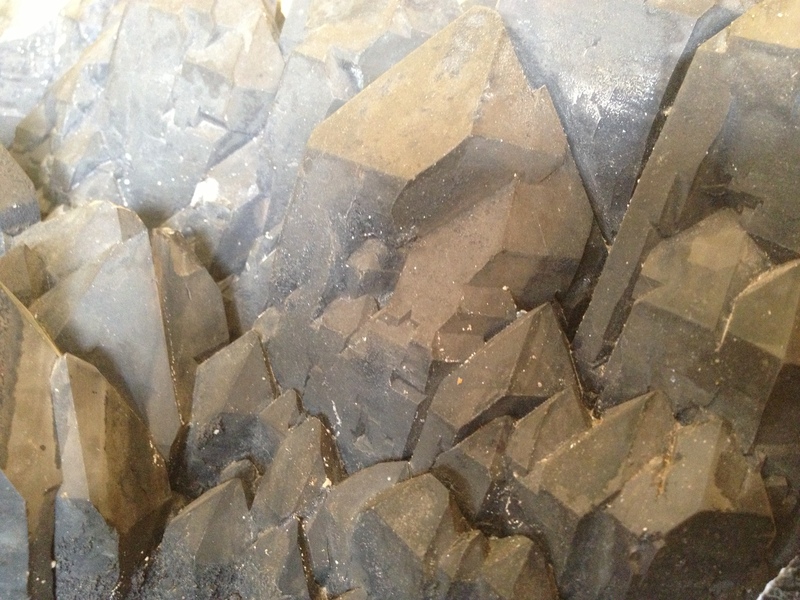 This arrangement is of my own ‘making’ – the choice of stones that participate in this important energy sector (of the human body) – have been selected and inter-related by me. 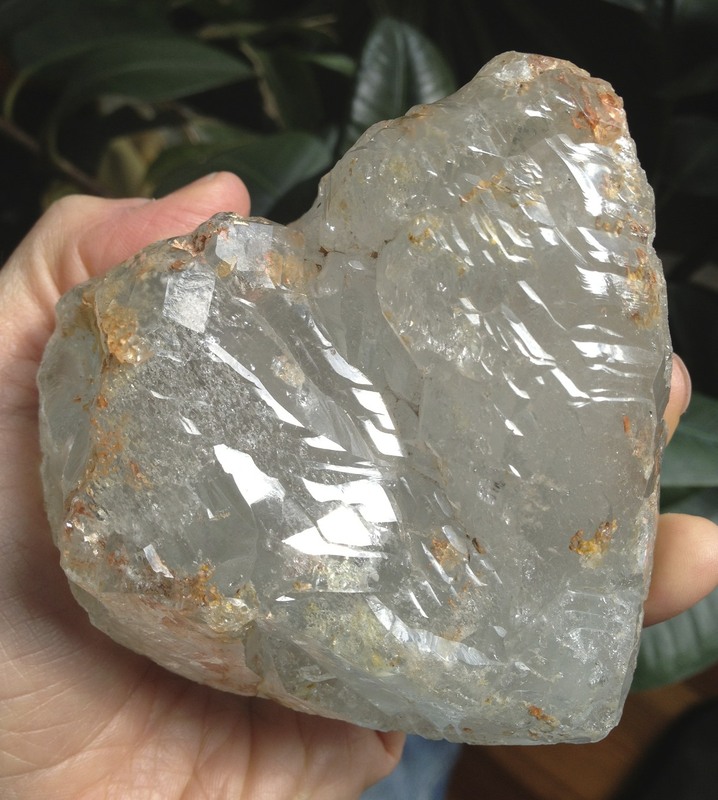 If you would like to learn more about how to dwell and explore the Heart Complex – through Meditation, Personal Sessions, or Live & Virtual Learning Opportunities – please contact Kyle Russell via email, at CrystalConcentrics@gmail.com. PS. what about Romantic Love? 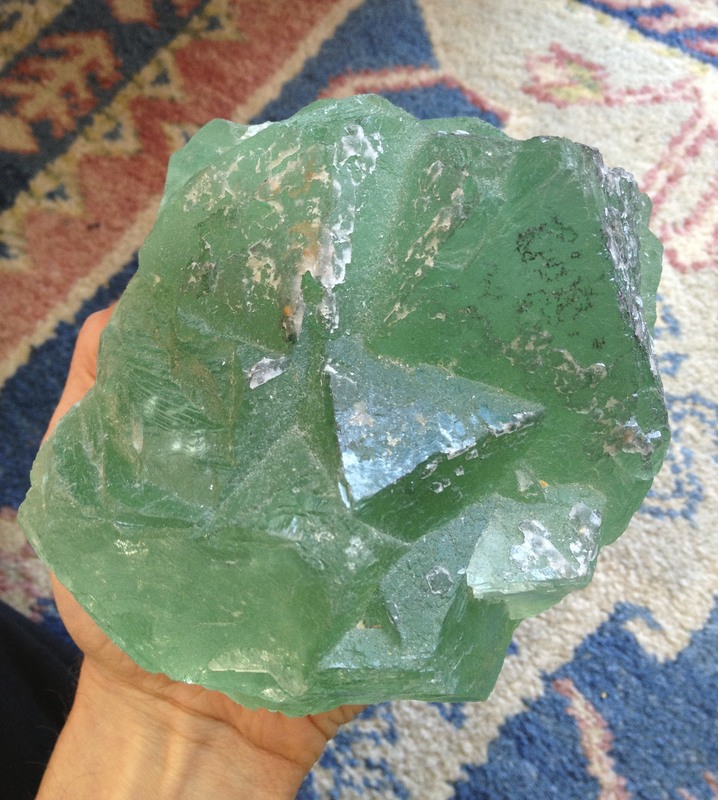 It exists within the personal experience of these various energetic “pulls,’ but can be represented by “couple stones,” or twins…which do not pertain (or reside) directly in the Heart Chakra…but may be meditated on, or worked on, with Crystals that fit this description (as pictured here). Similarly, multi-point conglomerations (not necessarily clusters) can represent families, children, etc. 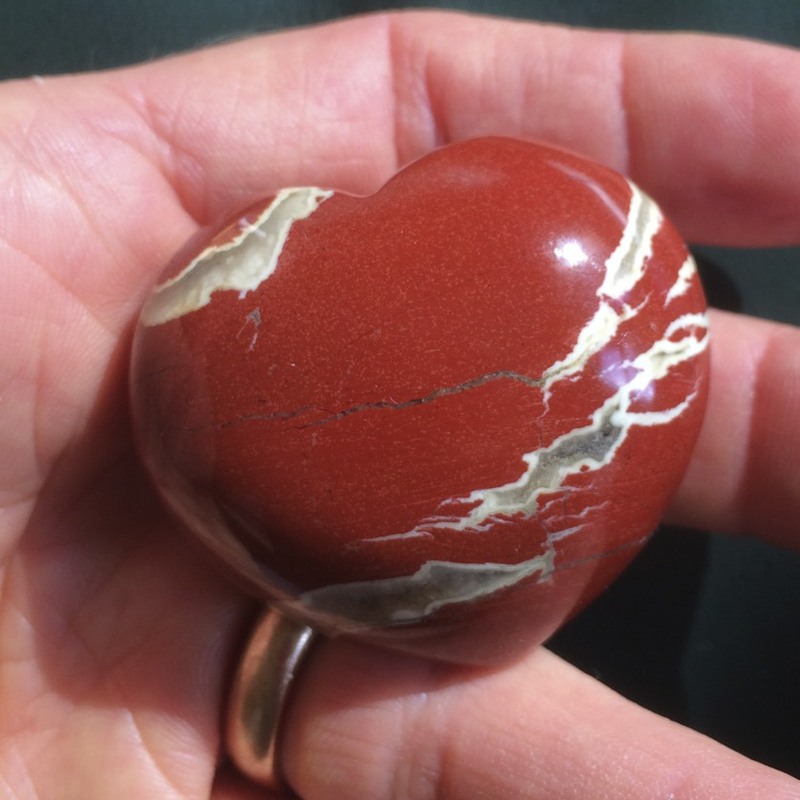 What stone can be used to attract love? That’s an interesting question, and not an easy one to answer. I believe that working with the other stones, and all that they “conjure” in the human breast, as well as approaching your life holistically, with an eye to balancing your energies, and more importantly…letting Universal Energy flow maximally through your being, and without snags…THAT is the way to open yourself up most easrily to receive Love into your life. A good variety of these mentioned stones are also accessible at the For Sale items page at www.Facebook.com/PowerStoneCrystals, or by request, with interest, to the email above. So after a year of having it on my list (of things to do), I’ve posted my ‘availability’ in the www.SpiritOfChange.org (a New Age magazine’s site) Alternative Health Directory. Availability to do what (you may ask)? It always feels like a stretch, to put myself out there in this way: “what if people ‘find out’ – what will they think?” In myself, I don’t care – it is what it is – and I know what I know. If it can’t hang with it, move on. I’m doing this not for the naysayers, but for the yay sayers, and I know there’s more (of ‘you’) out there than I think. I’ve built a musical database of 15,000 contacts+, ’cause that’s where I’ve put my energy. Where you water, that part of the garden grows. I may be nurturing this ‘plant’ inside, and that’s great – to be in connection that way – but what about my legacy. Is it really fair for me to ‘go to my reward’ without having made every effort to ‘share my brownies’ (as says my business mentor Fabienne Fredrickson would say). Some ‘brownies’ are for the Belly; some for the Mind; and some for the Soul. They’re not all gonna look the same. You can’t put them all on a shelf in a storefront, or even make them available Online. Everyone reaches a point in their life where they’ve got to take a leap of Faith. For some it’s by Choice; for others, by Necessity; and still others are sought out: ‘Chosen’ if you will (as I was…it’s a long story). Something I read in the Prayer Book at High Holidays about “the chosen are those who choose,” a weird tautology by which you cannot be selected unless you self-select…you opt-in (like you would for a Newsletter list). “The Universe cannot hear your call if you do not open your lips and make that call aloud – and clearly – for whatever it is that you want” (another paraphrase of Fabienne’s). These “truths” are self-evident, written mostly in self-help books (and was it the Constitution or the Declaration of Independence?). Indeed these sentiments are sourced in Scripture and Religion. But we need to hear them over and over again for it to sink in – the truth of it – never mind converting that intrinsic knowledge into action. Some think Revelation can only happen once we set things ‘right’ – here on Earth – currying favor with ‘The Father’ (and I mean that in the least Patriarchal way possible), and bringing closer the ‘Return of the Messiah’ (if that’s even a belief – or motivation – for you). The more Existential among you – even if Religious – may feel we have no control over Judgment – the Apocalypse (if that’s what we’re in for) – will happen when it happens. In either case, we’ve got to mind our knitting, ‘do what we have to do’ – not in the lowest sense of the phrase – but in the highest, loftiest sense of it. We all return to the Earth, whether as a lifeless body, or up in smoke (if we’re cremated). Our component elements are returned to the ground or the ethers, and that unique thing called our Spirit, or Soul, either dissipates forever; is transmuted into something else; or lives on, retaining some semblance of the identity exhibited while lodged in our person. Enter my argument regarding the original and eternal nature of stone – it was here before us (though not in the same way as the Creator, who supersedes – and includes – all physical manifestation) – and stone will be here after us. There’s something reassuring in this knowledge. We “come back to the rock” – like a home base – or that place in the game “tag,” where you’re safe (if you’re touching it). I had some rocks I wanted to show you – but they’ll have to wait – I’ve realized this Blog post is free standing, and that’s how it should be out there. I’d hoped to write less this time around, but it’s been some time since the last Post, so maybe I’m making up for lost time. I’d also hoped this Blog process would be The Book I’m going to write this year (ie. over the next 11 months anyway), but I realize – and so it should be – that this process is different, and should have its own identity…I can work out the book and bring you other updates independently…hope you’ve enjoyed reading, and I welcome your positive feedback.